One of the ways that we have saved money in the last few years is to cook at home. 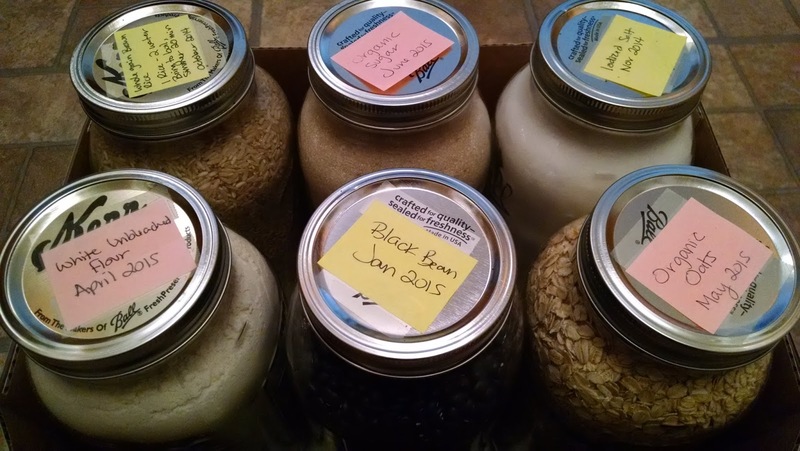 Many families do this to stick to their budgets but I try to take it a step further and make most of our grains/legumes based foods at home, too. I've spent a long time figuring out how to make a wide variety of dishes that start out as whole grains and beans. A quick calculation in the grocery aisle makes it clear though that buying in bulk is the best way to pinch those pennies. Often there is only a few dollar difference between a 5 pound bag of something and a 10 pound bag... and the savings only grows when you get up to the 20 to 50 pound bags. ... But how do you STORE all of that stuff? 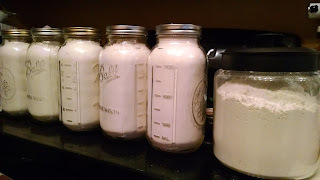 My storage solution: 1/2 Gallon Ball Canning Jars for storage, and a large glass jar with a mouth wide enough for measuring cups to dip in and out for items I am using day to day. What are you trying to keep out of your food? Bugs? Moisture? Other people? What kind of disaster might happen in your home that would damage the food? Flood? Fire? Tornado? Earthquake? How long do you think it will take you to use the item? Do you need to vacuum seal it or freeze it to increase its shelf life? How easy will it be to rotate your stock? I did a lot of research and decided that I couldn't decide! While I was trying to figure out how I'd come up with the money and room for several Dry Food Vaults, I came across a 6-pack of half gallon jars at the grocery store. They were about $10, and looked to be enough to store the open bag of flour I had sitting in the pantry. I picked it up as a cheap interim solution, and figured out that I LOVE these jars! 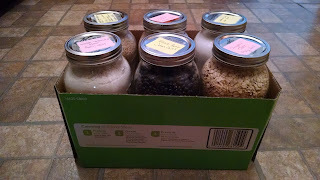 One of my "Bug Out Boxes" of bulk food. The half gallon jars are big enough to hold about 7 cups of dry goods. They have measuring marks on the sides, so you know how much you have as you're using them. They are made of glass so I don't have to worry about plastic degradation or chemicals leeching. With a jar attachment on a food sealer, you can even vacuum seal them to increase their shelf life. I even found that I love the 6-pack box that the jars come in. I store the with six different bulk items in one box. This way, in an emergency situation, we can just grab a couple of boxes and have a range of food items at our disposal. Not all of the boxes are the same, but generally have a flour (white or wheat), a salt (sea or iodized), oats, rice, beans and sugar. In an extreme emergency, the jars even work for cooking in - just add boiling water, stir, and in time the beans, rice and oats will cook themselves. The major downside to glass is that we live in an area where earthquakes can and do happen, so I am running the risk that the jars will fall from shelves and break, spilling the food. I've reduced this problem by also storing in large bulk 4 gallon food safe plastic buckets. Hopefully if we do have a big quake some of the stores will survive. I am careful to always label each jar (I use post-it notes and tape so I can change them out easily) with what the item is and when I purchased it, so that I can reduce spoilage and confusion. This especially comes in handy with tracking the different salts and flours which often look the same even though they have different tastes and textures. The most important part of storing your bulk goods is to find a solution that works for you, and to be consistent with it. Rotate your stock so that you are always using the oldest stuff first (First In, First Out!) and if there is something that takes you forever to use up, consider purchasing a smaller supply of it the next time around. Don't be afraid to try different sized containers, and try not to get so financially invested in a solution that you stick to it even if you don't like it. I know that my solution may not be the right one for you, but I hope that it helps you on your journey to having a healthy pantry. After countless summers camping with family and friends, and coming home with WAY too much food, we have implemented a new system to keep us all on budget. Instead of us all just bringing food to share "banquet" style we have begun assigning meals (or a portion of each meal) to each person that we are camping with. It has worked out really well and has cut the food budget that we normally set in half. Here is a sample of one of the plans we have used. Mr. Kawaii and I are responsible for part of two meals over a 4 day camping adventure with about 7 other families. We are feeding about 30 people per meal. Pass the hat for Pizza $$! Even though we are buying enough food to feed an army for each meal, the way it is split up makes it easy for us all to find the best deals, makes storing the food easier because we aren't trying to commingle frozen foods, cold foods and not cold foods in our cooler, and takes away the problem of only eating burgers 3 meals a day for 4 days. This has been working really well for us this summer and I hope that you can implement it into your own vacation plans. It has been a couple of months since my last post here because, as often happens, life has erupted and gotten in the way. We've been making some big changes that will be great for our budget. Mr. Kawaii and I have reduced our overhead by moving our family business back home and although that is taking some time to adjust to, it is going pretty well. We've decided not to stop there though - we have made the decision to downsize even further. We have committed to spending the next year downsizing our belongings. Sometime in the next year, we will begin constructing a tinyhouse! If you aren't familiar with the tinyhouse movement the concept is to take your family, reduce your belongings to the essentials that you need for basic living and comforts. Move it all into a space between 80 and 1,000 square feet. and move forward with more financial freedom. We haven't finalized our floor plan yet, but we think we will build our tinyhome on a 30 foot trailer. We will be snug, but we estimate that the change from 1,400 square feet to under 400 will free up several thousand dollars a year to go toward purchasing property, travel, and becoming more financially free. An example of a 355 sq. 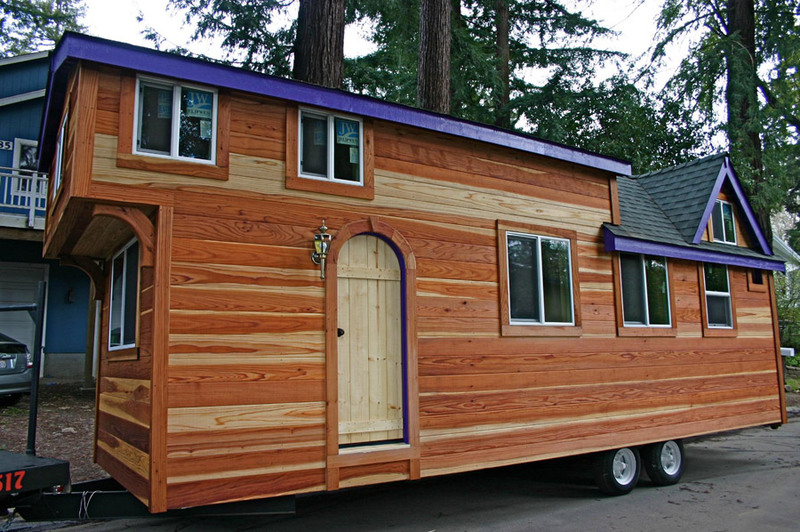 ft. tiny house by Molecule Tiny Homes. Mr. Kawaii and I were considering building a custom RV to put on property last year, but we have come to realize for roughly the same cost as the travel trailer we would design we will be able to enjoy more traditional housing construction (insulation, real wood, real tile, etc.). The house will still be on wheels so we can move it with us, but will be more comfortable wherever we land. I am very excited about this plan, and the freedom that it will open up for our finances. If you'd like to learn more about Tiny Houses, some of our favorite shows to watch can be found on YouTube. Check out Tiny House Nation for a range of ideas about downsizing from a big house into a tiny house.